Front row (left to right): 1. unidentified, 2. unidentified, 3. unidentified, 4. Margie Reay, 5. unidentified, 6. unidentified, 7. unidentified. 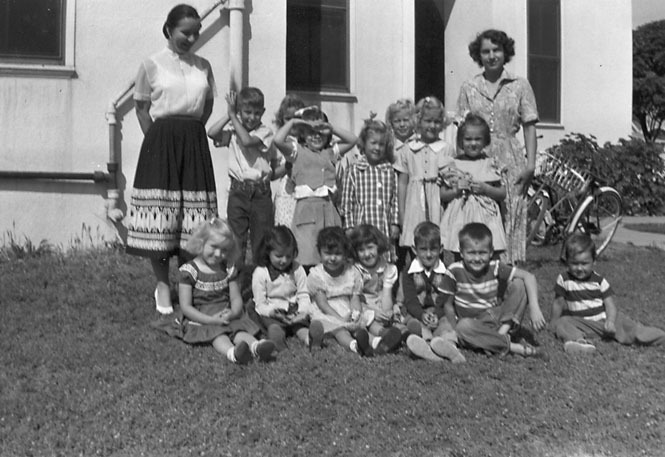 Kids in the back row: 1. unidentified, 2. unidentified, 3. unidentified, 4. unidentified, 5. unidentified, 6. Kathy Bireley, 7. unidentified. Adults: 1. unidentified, 2. unidentified. Credits: From the collection of Margie (Reay) Kiser. Thanks to Kathy Bireley for identifying the kids in the picture. For more information on Asbury United Methodist Church, see their website. Many of the kids in the picture would be members of the high school graduation class of 1967. To find other pictures of the class of 1967 in the archive, see Livermore class pictures listed by year of high school graduation: 1967. And if you have any pictures of the class of 1967 that you would like to share, please submit them to the Archive. To find other pictures of youth activities sponsored by the Asbury Methodist Church, see Pictures from sunday school, church groups, and other religious associations: Asbury Methodist. And if you have any pictures of church sponsored youth activities that you would like to share, please scan them for the archive.